Al Arabiya news, is a large competitor to Al Jazeera and is Saudi owned. Though this story appears in their English edition, it is a safe bet that this is pretty big news in the Arabic speaking edition as well, although the Saudi website doesn't go over the top at all. If anything it seems downplayed a bit, but that might just be me. "Gabriel, born to Muslim parents in Upper Egypt, grew up immersed in Islamic culture. He memorized the Quran at age of 12 and graduated in 1990 with a Masters degree from the prestigious Al-Azhar University in Cairo, the preeminent Sunni Muslim institution of learning. In the lower section, the word “Allah” is written partially on top of the word “except,” noted Gabriel, the author of “Islam and Terrorism” and “Journey Inside the Mind of an Islamic Terrorist.”"
I find it interesting that Al Arabiya was sure to point out that the Glenn Beck owned, "Blaze" has had "a professor of Indo-Muslim and Islamic Religion and Cultures at Harvard University, Dr. Ali Asani, to seek a further opinion regarding the translation of the engraved ring. Asani denied the validity of the photographs of the ring as he they weren’t clear enough." You will recall that Beck makes almost a habit of ridiculing "birthers" while clear police evidence shows that his birth certificate is fraudulent. You can see my rant here on that subject. - W.E. When contacted by Al Arabiya English, The White House refused to comment on the claim. Joel Gilbert, an expert in the Middle East and producer of “Dreams of my Real Father” -- a documentary questioning Obama’s real father and validity -- was the first to grab the public’s attention regarding the wedding band. Obama’s birth certificated was even requested by the conservative party to validate his religious ties during the 2008 U.S. Presidential Elections. At an earlier breakfast with his constituents in February, 2012, Obama shared his defining moment during his Christian faith as he met Christian evangelist Billy Graham. Obama has been vocalized about his Christian faith in public on endless counts since he became a president in 2008. In an exclusive interview with WND, Mark Gabriel, author of “Journey inside the Mind of Islamic Terrorists”, confirmed the ring to carry Arabic inscription of the Islamic Shahada. In the lower section, the word “Allah” is written partially on top of the word “but” explained Gabriel. 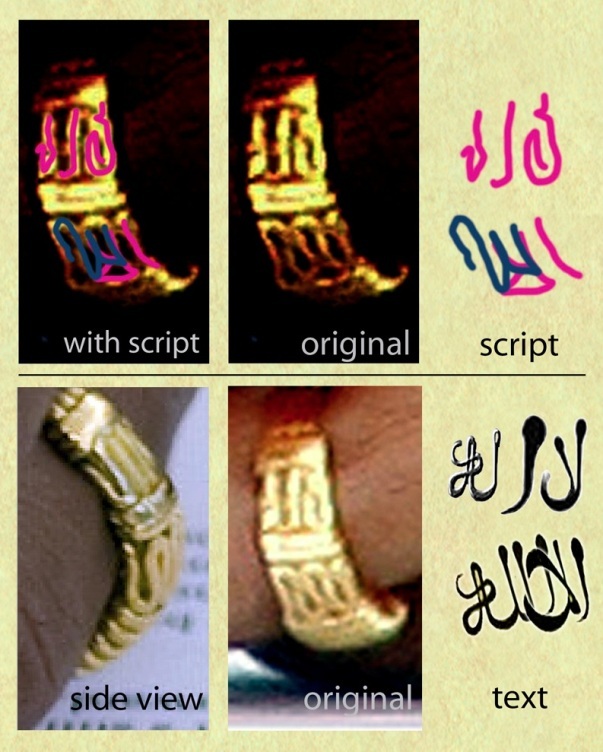 TheBlaze.com, a conservative American online media outlet, interviewed a professor of Indo-Muslim and Islamic Religion and Cultures at Harvard University, Dr. Ali Asani, to seek a further opinion regarding the translation of the engraved ring. Asani denied the validity of the photographs of the ring as he they weren’t clear enough. “I'd actually have to see it much closer to see exactly what it says,” explained Asani. Last week’s presidential debate resulted in head-to-head tied race after Obama was leading the elections last month.